(Top row, from left) John Meyer, Preston Smith, Neal Khurana, Chris Wickman. (Middle) Dan Jeong, Kumar Madassery, Jack Laney, Paul Lewis. (Bottom) Nabeel Anwar, Christian Malalis, Mehmet Kocak, Ankur Patel. Photos by Lauren Anderson, Rush Photo Group. All those men out there who have always had a mustache, and may feel slighted by us making mockery of a mustache, let me say we honor and are in awe of you fellow sirs. I don’t think anyone of us can go more than five minutes without feeling the itch or prickly spines of the lip grasses that we have been nurturing. Our hats go off to all of those who wear them all day, every day as part of their natural rugged good looks. The reason for growing mustaches is that we need something to display our support and awareness of men’s cancers, specifically prostate and testicular cancer. In a sense, prostate cancer is the male version of breast cancer. Statistics from the National Cancer Institute show that between 2005 through 2009, approximately 155 out of every 100,000 men were diagnosed with prostate cancer. To put that in perspective, the same institution reports in the same period about 124 per 100,000 women were diagnosed with breast cancer. Men have a 16 percent lifetime risk of being diagnosed with prostate cancer, and approximately 28,170 men will die in 2012 from it. The point of this isn’t to say that prostate cancer is worse or to belittle breast cancer awareness and fundraising, rather to find ways to promote research and public awareness about prostate cancer. I think the biggest challenge in growing these soup strainers has been the shock and cringing looks from many of our spouses, who are not used to seeing us look so amazing. It throws them off, to the point where having a serious conversation at home becomes very difficult, because somehow they only see the ‘stache, and not the rest of our face anymore. All kidding aside, everyone has been very supportive. I think something we all notice is that, walking around the hospital, you can sometimes catch people doing a double take, and then quickly looking away. We know that this is not because of how attractive we look, because we’ve walked the same floors without the mustaches and never gotten those reactions. I think we have all been a little self-conscious in the beginning, but what I’ve noticed over the last week or so is that we all walk proud of our lip furniture, many times in groups, like a powerful testosterone-laden force roaming Rush. The actual group, Movember and Sons, started this activity in Australia, around 2003. Since then, all together, about 2 million mustaches have participated around the world, raising nearly $300 million dollars thus far. We just wanted to do something as a team to help raise awareness for this important cause. All of the money raised goes directly to men’s cancer health initiatives. We invite and ask anyone and everyone to check out our facial efforts, and if you feel the inkling, go ahead and donate whatever you can to our team, the MoDocs. It is greatly appreciated. 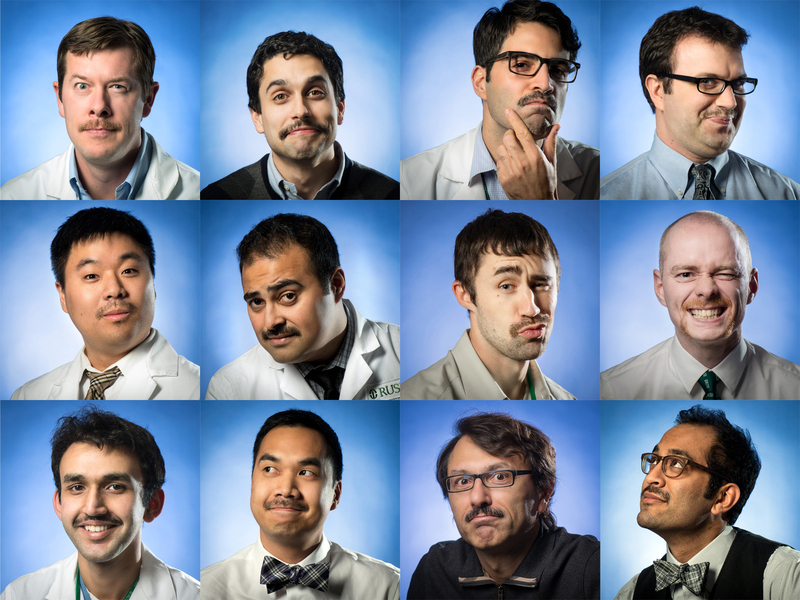 This entry was posted in Cancer and tagged Movember, mustaches, prostate cancer, radiology, testicular cancer. Bookmark the permalink.